The agreement was signed on December 4, 2018, at a ceremony attended by representatives of HEC Montréal and the Universidad del Pacifico: (left to right) Federico Pasin, Mariella Hernandez Salazar, Martha Chavez Passano, Michel Patry, Marie-Ève Porlier, Sylvain Perron and Hassan N. Taghvaï. HEC Montréal is extending its reach to South America with the creation of a double undergraduate degree in Business Administration, in partnership with the Universidad del Pacifico (UP), in Lima, Peru. Under a program specifically designed for UP students by the HEC Montréal International Activities and Student Mobility Department (AIME) and the UP Office of International Relations, they will first be taught by HEC Montréal professors. Members of our faculty will travel to Peru starting in fall 2019 to give some program courses in hybrid format, i.e. consisting of online and classroom sessions. 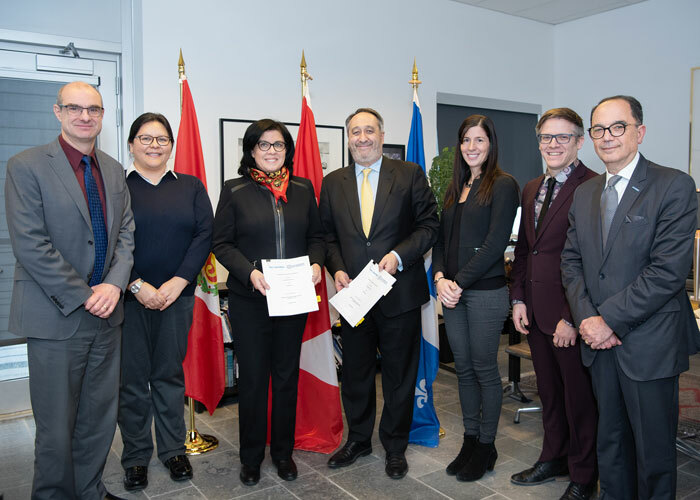 Then, starting in January 2020, the first cohort of Peruvian students will come to Montréal to continue their studies in the Bachelor’s in Business Administration (BBA) program, before returning to Lima to complete the program. Students in this joint program will be granted two degrees: a BBA from HEC Montréal and a Licenciado en Administración from the Universidad del Pacifico. The Universidad del Pacifico is a renowned private university offering courses in English and Spanish. It also holds AMBA and AACSB International accreditations. HEC Montréal launched undergraduate dual degree programs in 2011 and now has 11 partners worldwide. In 2017–2018, the School welcomed nearly 50 students as part of these programs.